Vital factory maintenance work in the sugar factories across the country and other field works were severely affected, today, as the overwhelming majority of sugar workers struck solidly in support of the Wales sugar workers and those aggrieved residents in on-going efforts to “stay the decision” to close the Estate. 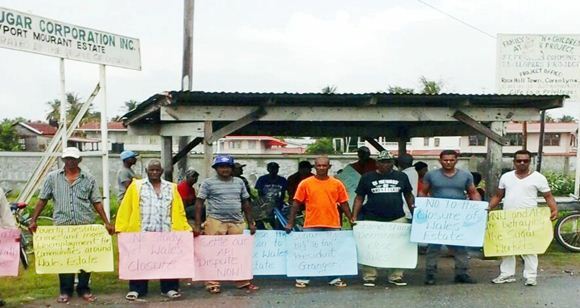 Members of the Guyana Agricultural and General Workers Union (GAWU) and the National Association of Agricultural, Commercial and Industrial Employees (NAACIE) are engaged in today’s solidarity action which highlights the fact that workers of both Unions will have their livelihoods threatened by the Wales Estate closure. 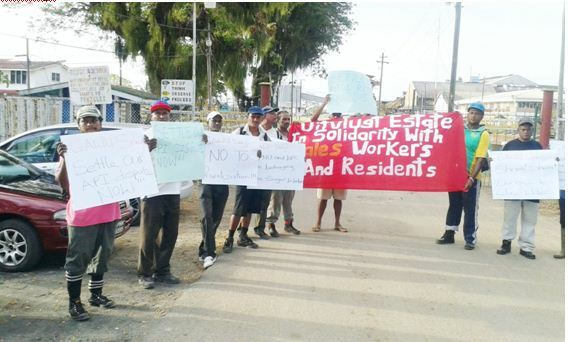 The solidarity strike proceeded during the day with picketing exercises at the various Estates Administrative offices with placards reading: “No to the closure of Wales Estate”, “Poverty, Destitution, Crime and more Unemployment for communities around Wales Estate”, “APNU and AFC are betraying sugar workers” among others. At today’s picketing exercises, workers also drew attention to the outstanding wages and API matters for 2015. This afternoon, a demonstration culminating at the Patentia Tarmac for a Public Meeting is also scheduled. GAWU, in a statement, said the intention by the Corporation and political authorities to shut down Wales has set in motion justifiable anxiety. “Of the wider workforce who are increasingly asking: What next? Who’s next? This unconscionable blow from the authorities has only fed the alienation within the industry and will, most likely, de-motivate this sector of our productive workforce,” GAWU stated. According to the union, some 2,500 workers and farmers would be directly affected by the Wales Estate closure. Additionally, it is distressing to contemplate the hardship that will befall the families of those who will join the jobless. “We can only begin to imagine the effects of the economic dislocation that will ensue and the repercussions it would have on the communities of the West Bank of Demerara, especially,” GAWU stated. The intransigence, so far, displayed by the authorities is a cause for concern for workers not only in the sugar industry but workers generally. When considered against the unjust treatment meted out to the sugar workers over the latter part of 2015, and ignoring essential practices of Trade Unionism, the situation is indeed troubling. The GAWU and NAACIE urge the Government and GuySuCo not to go down the path of closure of the Wales Estate. “We are sure that is it not beyond available expertise to come up with proposals to save Wales and once more, ensure its viability. We subscribe to the belief that people and their well-being must be given priority attention,” the unions urged. Looknah not even sure if that is your name, you are nothing but a nuthead… get a reality check..
you foolish idiot come on here to question my identity while without anyone asking you declare yourself as debrawillis, drawing attention to your own identity so everyone know now that you are the real village dunce talking about reality check? just look at this nonsense by the most irresponsible group of industrial workers anywhere in the world being misguided by an equally irresponsible union. nowhere in the world can be found a more silly group of workers who are furthering the demise of their workplace by creating financial damage to an already cash strapped industry that has no money due to mismanagement by the very union which in cahoots with the former government bankrupted the sugar industry. this government cannot allow the politics behind what is going on in the sugar industry to damage other sectors of the country. it must get rid of the sugar industry once and for all and let the chips fall where they may. Till this modern day Sugar workers are allowing themselves to be used as pawn to their own self destruction. The move by the Gov’t is to cut off the bad arm (Wales) to save the rest of the organs is in the best interest of the majority. However, the whole body so infected by the misinformation and bad leadership of the GAWU is taking themselves to the path of further woes. What leadership has GAWU given to the workers in the interest of securing their jobs, none, this path of continuous strikes as detailed by the union will destroy the industry further. Why do we have to go abroad to behave like obedient pups to the masters and not to the development of our own country. It is of the best of interest of the majority of the sugar workers to work towards the best of their self interest and not of the agenda pushed by Chand and cronies. Reject his and others call to strike further. They go abroad because we have become a people with a welfare mentality, who has no intention of building our country thru sacrifice but going where others have done their hard work and so classified us as blood-suckers. What these strikers are not aware of was once the Skeldon Estate was performing to expectation, many of the smaller ones would have been closed. This was the gamble the previous government was prepared to take, ensuring the region 6 votes remain in the party bag.